My subject line is the title of a children's book written in 1942 about the Jeffrey's Hook Light, a small red lighthouse at the foot of the massive George Washington Bridge. Although I've lived in New Jersey most of my life I never even knew about this little lighthouse until five years ago, when I happened to go with my sister and brother-in-law and their kids to the park that runs along the Palisades near the bridge. 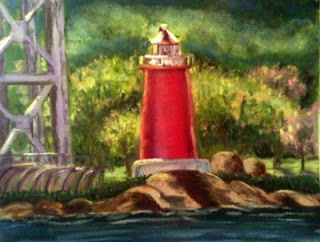 There I saw the Little Red Lighthouse for the first time, and thought both how cute and incongruous it looked. Then, when I was trying to think of another lighthouse to paint for my series that will be in the art show next month, I thought of it. My time is short. I had no time to go down to the Jersey shore and capture photos of Twin Lights, or Barnegat Light, or any other NJ shore lighthouses, but I figured I had time to drive up to the bridge and get a photo of the little light to use as a painting reference. So that's what I did yesterday morning before the Pastel Society of New Jersey's spring meeting. I drove north along the river, following the road that takes you underneath the GW Bridge, and stopped at a couple spots along the way to take photos of the lighthouse. I finally chose one for a reference, and painted this morning while I was on call for an upgrade at work.